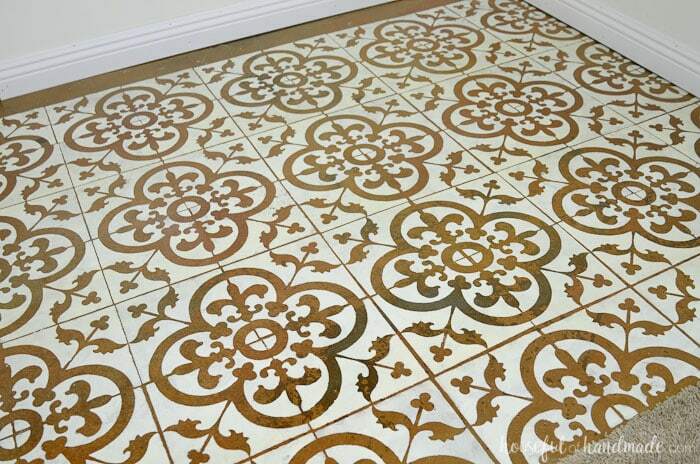 Transform your floor on a budget with a floor stencil. You can create a beautiful patterned tile design for a huge impact in any room. 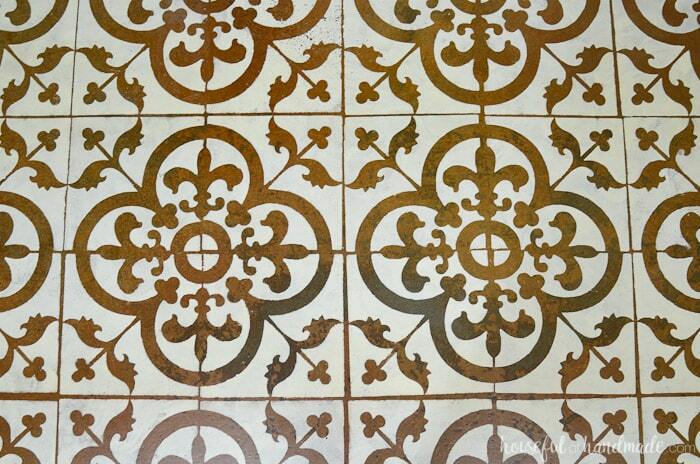 See how easy it is to paint a floor stencil with this easy tutorial. 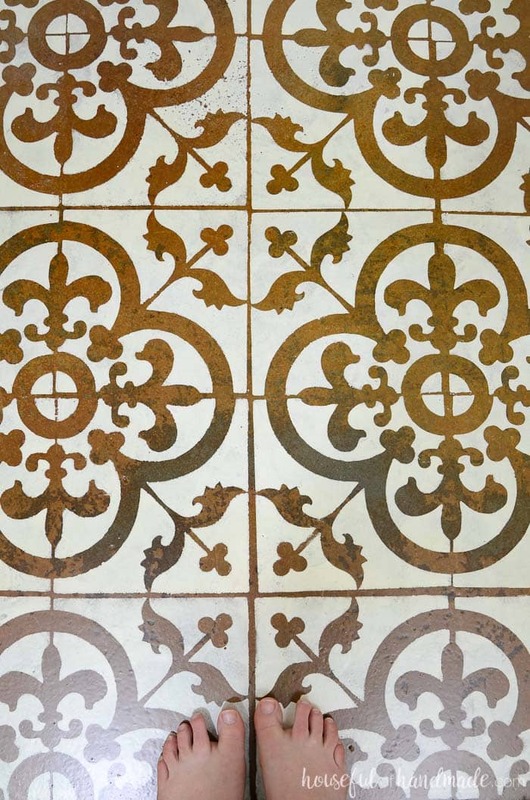 A floor stencil is the perfect way to add style to a boring floor. 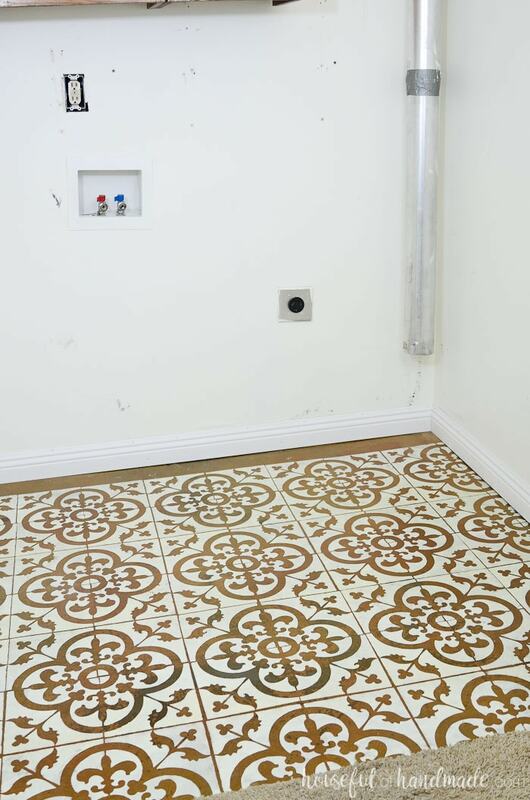 You can turn a plain floor into a patterned tile showpiece for just a few dollars and a few hours of work. The boring concrete floor in our laundry room is now a floor I want to show off. It’s been a whole week since we started the $100 Room Challenge and I am already loving my laundry room more. It doesn’t look a whole lot different, except the floor! I knew I needed to do something special to the boring stained concrete floor. But replacing a floor would have killed my $100 budget. So I used a budget friendly option and decided to paint a floor stencil on it instead. Now it has been transformed into the beautiful patterned tile floor of my dreams. I have been obsessing over patterned tile lately. And ever since I used a homemade wall stencil to add a faux patterned tile wall to my office, I knew I wanted to try the same technique on the floor. 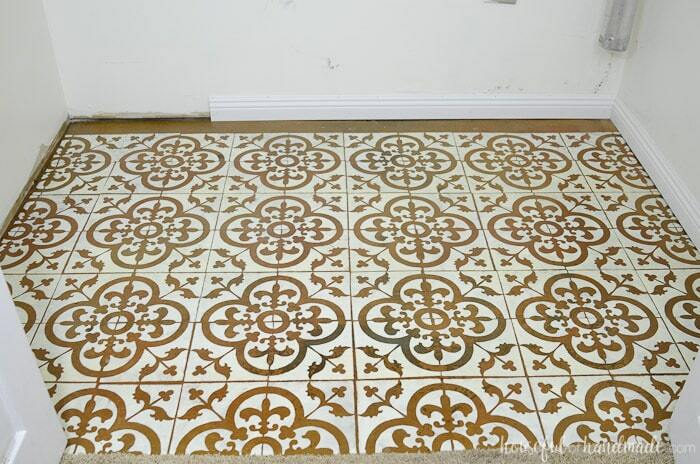 I love how the patterned tile stencil makes such a dramatic change to the floor. Sometimes I find myself standing at the doors to our laundry room closet just staring at the beautiful pattern and texture. I couldn’t be happier! You may be thinking that the floor is beautiful, but it had to have taken so much work. Well I am here to ensure you that it did not. Our laundry room closet is 8′ wide and 5′ deep. The patterned tile floor stencil was painted in one afternoon and then the next day I added 4 coats of sealer that only tool 15 minutes each coat. This floor was transformed in less than 6 hours of work. So now you know how quick and easy it was to paint a floor stencil on our laundry room floor, but of course, it’s also about budget! How much did this cost? 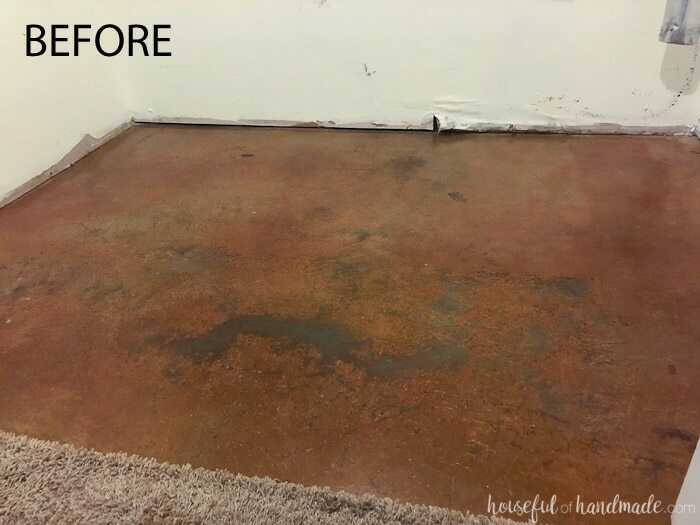 By using paint that I already had on hand and making my own stencil, I was able to transform the floor of our laundry room with less than a 20% of our $100 budget! Not bad for adding tons of style to the old laundry room floor! If you want to see all the steps of how to paint a floor stencil, click on the arrow below for the tutorial. And don’t forget to check out the rest of the Week 2 updates for the $100 Room Challenge.